MINDLESS vandals have burned down a bowling club’s pavilion at a popular social club. The arson attack at the Land Rover Sports and Social Club took place on Friday evening. Firefighters were called to the scene at 8.20pm. They found the wooden building - which stands by the side of the bowling green - was well and truly alight. It took just over an hour to extinguish the blaze, but all that remains of the structure is a charred shell. Margaret Currier, treasurer of Land Rover Bowling Club, said: “Words fail me. I can’t understand the mentality of the people who have done this. Our main building has now been razed to the ground, but we’re determined to keep the club going. A spokesman for West Midlands Fire Service said that crews from Solihull and Hay Mills Fire Station attended the scene. The fire was out by 9.25pm and the matter was reported to police. The incident on Friday is the latest in a series of arson attacks at the Rowood Drive venue. Only two months ago, arsonists torched a hut and damaged the club’s lovingly tended lawn. Today (Wednesday) members of the club - which has been going for 40 years - will have a meeting with police and Solihull Council to discuss security. A spokeswoman for West Midlands Police said enquiries were ongoing - anyone with information can call 0845 113 5000. A WOMAN and two young children were rescued from a block of maisonettes in Chelmsley Wood following an arson attack. 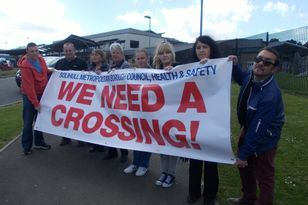 SOLIHULL Council has poured cold water over plans for an anti-social busting booze ban in Castle Bromwich.